Granville was nicknamed the “Monaco of the North” in the 19th century thanks to its resemblance to the principality. 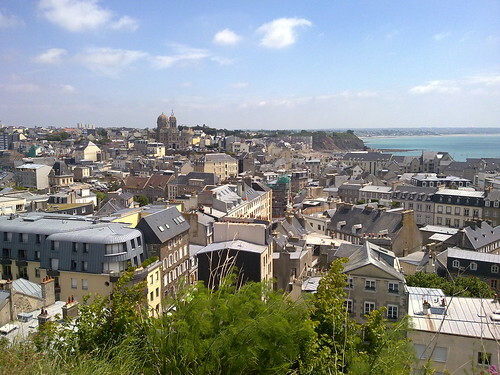 This coastal commune is located in the Manche region of the French province of Normandy. Administratively, Granville includes the Isles of Chausey, which is a group of small islands and islets that are a part of the Channel Islands – it is among the few on the channel not under British jurisdiction. Granville has played host to famous figures over the years. Former residents include artist Maurice Denis, writer Michelet who penned La Mer in Granville, and fashion designer Christian Dior, whose family home Les Rhum’s is open to the public. Another of Granville’s famous sons is Richard Anacréon. During the 20th century, Anacréon was a generous patron of the town’s artists and writers. Upon his death, the town was bequeathed with his collection, which today forms much of the exhibition of works displayed at the museum named after him. The old part of Granville preserves its military and religious history. The upper region of the old town is enclosed by 15th century ramparts and entered through via the Grand Porte draw bridge, which was the setting of the bloody Vendéens wars in 1793. Inside, you can observe many beautiful houses, especially on Rue Saint-Jean. Also worth visiting is the ancient church, Notre Dame du Cap Lihou, which was completed in 1441. This church dominates the horizon with its imposing Romanesque style granite stones. The structure was built during the Hundred Years’ War. In one of the gates of the church, there is a museum that houses a collection of documents and items that provide a peak into the millennial history of the town. The Old Granville Museum and the private mansions in Upper Town offer more interesting architectures in Granville. The lighthouse at the top of the rock by Granville harbor is worth checking out as well. From the lighthouse, visitors can see the Isles of Chausey which is about 10 miles out to sea. In the spring, the Granville harbor at low tide and substantial hectares of shore including some reefs are left uncovered by the sea. Granville was founded by the English. In the Middle Ages, they built a fortress on the headlands, a deserted wasteland. The stronghold was soon captured by the French, but not before the English dug the “Trench”, a passage that connects the town to the Plat Gousset. The barracks located above the harbor and bearing witness to the city’s military past today are used for civilian purposes. In 1793, Granville was attacked by royalist rebels looking to find the Emigré army and the English fleet here. Town soldiers, sailors, and civilians joined forces to defend Granville and the walls around the Upper Town. They also put out the vast fire lit up by the rebels. Granville grew prosperous in years past from privateering and the fishing for wild oysters that took place off the Grand Banks. This wealth of old is still on display; Upper Town is lined with superb private mansions and the Notre-Dame church boasts luxurious decorative features. The Old Granville Museum is another reminder of the glory days. Unfortunately, the decline of fishing and privateering has led to a decline over the years. Today, fishing for shellfish and clams still take place, but tourism and thalassotherapy and physiotherapy treatment provide the bulk of the town’s income.